I’m an avid shopper and coupon-clipper. 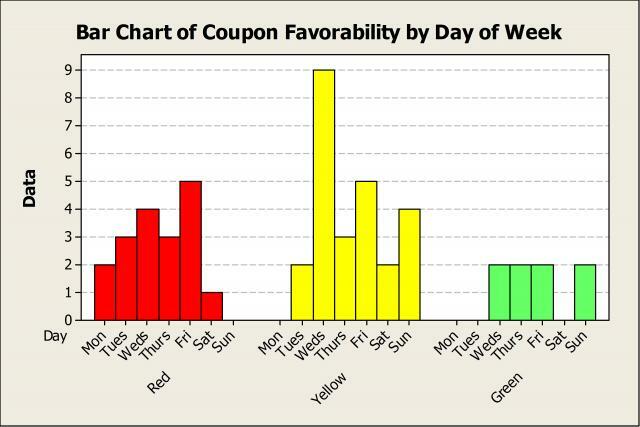 I receive most of my coupons via e-mail and I often wonder what day of the week the best coupons will be e-mailed. In my attempt to live a Lean life, I think finding this out will save me time and prevent me from opening some of the hundreds of promotional e-mails I get each week. Based on my own personal preferences, I ranked coupons that included dollar savings (i.e., $10 off $25) higher than coupons that required the use of a store credit card to receive savings. I considered “not worth your time” e-mails to be those that were just promotional (i.e., "Check out our new summer styles") and didn’t include any coupons. I used four weeks of e-mail data (51 total messages) and I chose the following retailers to analyze: Kohl’s, Cabela’s, Express, and Victoria’s Secret. 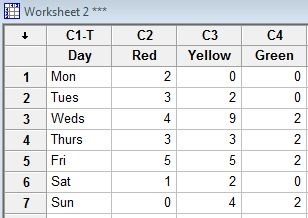 Next, I ranked and tallied the coupons by color and recorded the numbers for each day. The majority of the coupons I received are what I consider “noteworthy” (28/51, or about 55%). The e-mails that contained coupons I considered “not worth your time,” were more frequent than I would have liked, making up about 35% of all the e-mails sent. The doorbuster savings were the least frequent e-mails, with only 16% falling under the “so good you should skip work and go shopping” category. The majority of “noteworthy” or average savings were sent on Wednesdays and Fridays. “So good you should skip work” deals were most likely to be sent on Wednesdays, Thursdays, Fridays, and Sundays, but were never sent on Mondays, Tuesdays, or Saturdays. If you'd like to analyze your own coupon data, my best advice is to focus on the e-mails from your favorite stores, and remember that there’s probably going to be a higher likelihood for better savings later in the week. 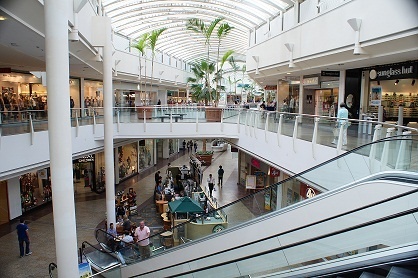 Stay tuned for another shopping-related post.